The number of two-wheelers in Gujarat has grown by 140% over the last decade, with Ahmedabad home to around 15 lakh such vehicles. Three out of four vehicles on the city roads are two-wheelers. Given these numbers, they account for a sizable chunk of all accidents, highlighting the importance of a good two-wheeler insurance policy. During 2016, the city witnessed an average of 5 accidents per day, resulting in six road related deaths each week. 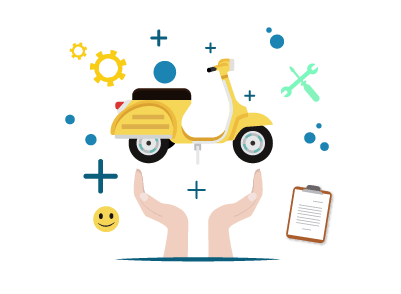 Choosing a good insurance policy can help offset financial damages caused by such accidents, with the government making it mandatory for all two-wheelers to have a valid insurance policy. Almost all major general insurance companies have a presence in Ahmedabad, offering a range of insurance plans for vehicles. Individuals looking to purchase a two-wheeler insurance policy in Ahmedabad can choose between these popular options. Note that the insurers mentioned in the list are not listed in any particular order and are just a few of the popular options available in Ahmedabad. With the city of Ahmedabad witnessing an average of 5 accidents on any given day, getting a damaged bike fixed can be a hassle, with most garages in the city catering to a large number of customers. The added stress of getting a vehicle fixed can be traumatic, which is why most insurers provide the option of cashless garages in the city. Individuals who meet with an accident which results in damage to their bike can approach any network cashless garage to get the damage fixed. It is possible to locate these garages through multiple means. One can find the nearest garage through the official website of the insurer. Most insurers provide a list of all garages they have a tie-up with. Customer care reps of the insurer can provide a list of all garages in the city. One will have to contact them on the customer care numbers mentioned by the insurer. The details of cashless garages in Ahmedabad could be mentioned in the sales brochure of the policy. In case of the policy being purchased through a sales agent, one could ask him/her to provide a list of all network garages. The cost of repairing a damaged bike can be high, especially if spare parts are hard to come by. Getting a bike fixed at a cashless garage can be advantageous in a number of ways. Ease of use – One needn’t run around finding a garage to get the vehicle fixed. Given the fact that the insurance provider and the garage have a tie-up, one can use the services without hassle. One would be expected to provide a few relevant documents for the same. Quicker – In most cases, a garage can take days/weeks to get the damage fixed. The longer they take to deliver the bike the more they charge. This isn’t the case with network garages, for the turnover time is often quicker than regular garages. Quality – One can be rest assured that a vehicle given for repair at a network garage undergoes quality service. These garages would use genuine spare parts, ensuring that there are no issues pertaining to the quality of products used. Affordable – A simple procedure at a non-cashless garage can set one back by thousands. Opting to get the damage fixed at a cashless garage is cheaper, for the bill is settled directly by the insurer. One would be expected to pay money out of his/her own pocket only when the cost of repair exceeds the cover provided by the policy. Replacement vehicle – An insurance provider could provide a replacement bike if the damaged bike is undergoing repair at a cashless garage. Additional services – A cashless garage might also provide additional services like towing. One can also request them to drop the repaired vehicle to their home after it is fixed. Most of us purchase a bike insurance in order to meet government regulations, but a good insurance policy goes beyond this, offering financial protection in case of any accident. With a number of options available, one can get confused as to which policy to choose. Keeping these simple points before buying the policy can help one get the most out of it. Premium amount – Certain insurers can charge a higher premium amount based on the cover they provide. It is a smart option to compare the premium charged by different insurers, for one can save a decent amount over the long run. The premium is computed based on the vehicle, with the maintenance of the bike playing a critical role in it. Cover – While it is mandatory to have a third-party liability cover, one can choose to get a comprehensive cover instead. This protects against a number of eventualities, and is a better option given the current road conditions. Policy inclusions – It is important to read and understand the policy inclusions. Each policy has a list of events which are covered. Opting for a policy with limited inclusions could negate the protection provided. Similarly, one should keep all the policy exclusions in mind as well. Claims process – Opt for a policy from an insurer who has a simple and effective claims settlement process. This reduces the hassle of applying for a claim, helping reduce stress and effort. Service – Choose an insurer who has a good service network. Their service should be available across the country, ensuring that all emergencies are catered to. Policy term – Most two-wheeler insurance policies come with a term of one year. Such policies are typically costly, with the hassle of annual renewal. One could opt for a longer term, eliminating the need for yearly renewals. Additionally, the premium for such policies is also comparatively cheaper. Discounts – The No-Claim Bonus (NCB) should be kept in mind while buying a policy. This can help reduce the cost of premium. India has seen a huge growth in its used vehicle market, with hundreds of two-wheelers sold across the country each day. Given these numbers, it is possible to end up purchasing a bike from a different state. While it is not illegal to do so, one must remember to transfer ownership of the insurance policy in order to enjoy the protection provided by it. Failure to do this could result in the insurance company denying cover in case of a claim. Transferring the insurance policy in the name of the new owner is simple, with it possible to do so by following these simple steps. Inform the insurance provider about the decision to sell the bike. Request them to transfer the policy in the name of the buyer. Provide documents of the sale. These include the registration certificate, the NOC from the RTO, insurance papers, etc. It is imperative that the buyer meet the basic criteria set forth by the insurer. In case of accumulated NCB, one should request for a NCB certificate to enjoy the benefits. Once all relevant documents have been submitted, the insurance company will review them and transfer the policy in the name of the buyer.